Our resident starlings have now been joined by thousands of birds that have migrated here to over-winter from Scandinavia forming huge flocks. 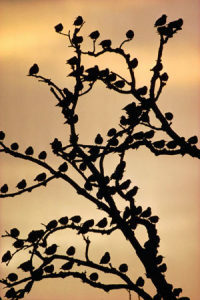 One of the most fascinating wildlife spectacles in the UK is to watch the Starlings ‘dance.’ Just before sunset the smaller feeding flocks join together to form massive roosting flocks of thousands, and sometimes, tens of thousands of birds. These birds will all roost together but before they settle for the night they perform an amazing dance, known as a mumeration. The best time to see starlings in this way is in the early evening about an hour before sunset between November and February. It is best to get there early as the length of the display varies. In bad weather the starlings may not display at all preferring to conserve their energy by going straight to roost. No-one can say with 100% certainty why starlings display as they do but there are a number of theories. Huge roosting flocks form for two reasons. Firstly there is safety in numbers and secondly the more birds there are the more heat is produced but this doesn’t explain why the displays happen. One explanation given is that the ‘dance’ is some form of communication between the birds, perhaps directing the numerous birds to good supplies of food. This explanation likens the starling’s dance to the ‘waggle dance’ of bees which took years for experts to understand. A second theory is that the graceful and fascinating movements are caused by individual starlings reacting to finding themselves on the outside of the flock and therefore more at risk from predators. It is thought that each starling requires a set personal space to fly and this space is kept at all times. When a starling finds itself on the outside of the flock it then reacts and moves itself to the inside. This then has a knock on effect on all the other birds causing the swift changes of direction. Some of the biggest flocks roost overnight in reed beds but starlings also make use of piers and buildings. 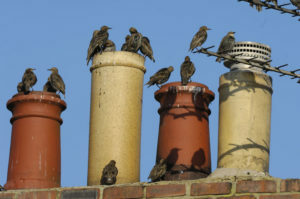 Although there are well known places where starlings roost be aware that they can move to new nesting sites and so it may take a bit of patience to see them in action. 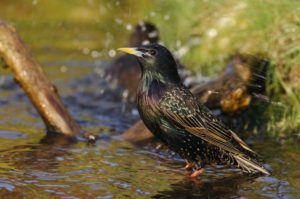 Somerset Levels – the Ham Wall reserve is well known for the starling displays.